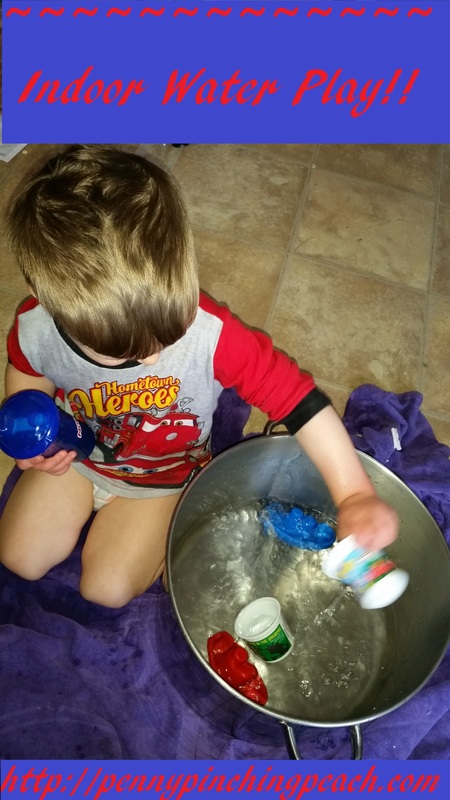 Indoor Water Play- a great way to keep toddlers happy indoors! My children are all little water babies. Usually this tendency shows in them splashing water all over the bathroom when they are supposed to be washing their hands. Finding them lingering in there playing in the sink and flooding the floor is frustrating , but I do try to give them fun opportunities to satisfy this urge to splash and pour. One thing they love to do, when they can’t go outside to play, is set them up with some indoor water play. I get out my humongous pot and fill it about a third of the way with water. I’ll set it on a beach towel on the kitchen floor, then throw in some cups, toy boats, funnels or other small items that will be fun to play with in the water. They can easily stay at this simple activity for the better part of an hour, especially if I switch out the toys every 15-20 minutes or so. Sometimes I give him toy cars and it’s a “car wash”. Other times he is giving his dinosaurs or doll a bath. Get creative! That’s the whole point! This activity works really well for my preschooler to do while I’m working with my oldest daughter on her school at the table. He’s usually very content and relatively quiet. It makes it easier for her to focus than if he’s running around being a wild child, even if she is working independently. Do your children enjoy playing with water indoors? For more fun activities for the cold weather this winter, check out 10 preschool activities using household items! Categories: Living Life | Tags: busy time, diy, indoor play, playtime, preschool, simple, summer, toddler, toys, water | Permalink. My youngest loves water, too. This is a good idea, especially about switching out the toys every so often – thanks!